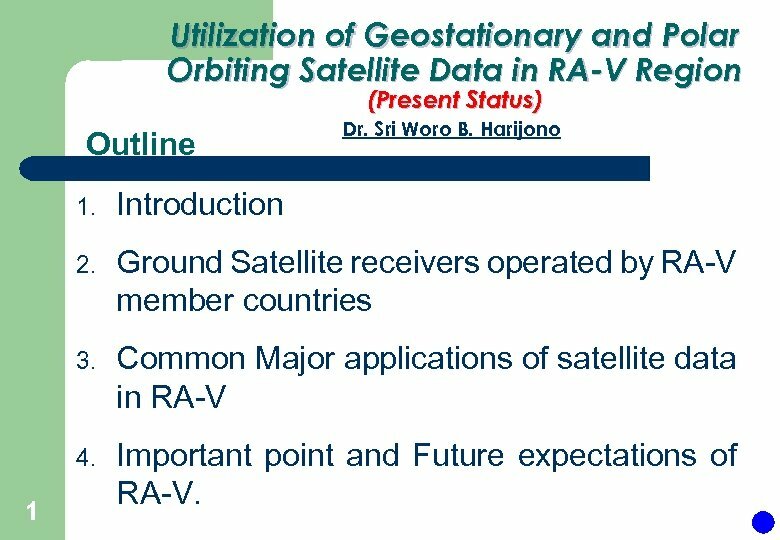 Utilization of Geostationary and Polar Orbiting Satellite Data in RA-V Region (Present Status) Outline Dr. Sri Woro B. Harijono 1. 2. 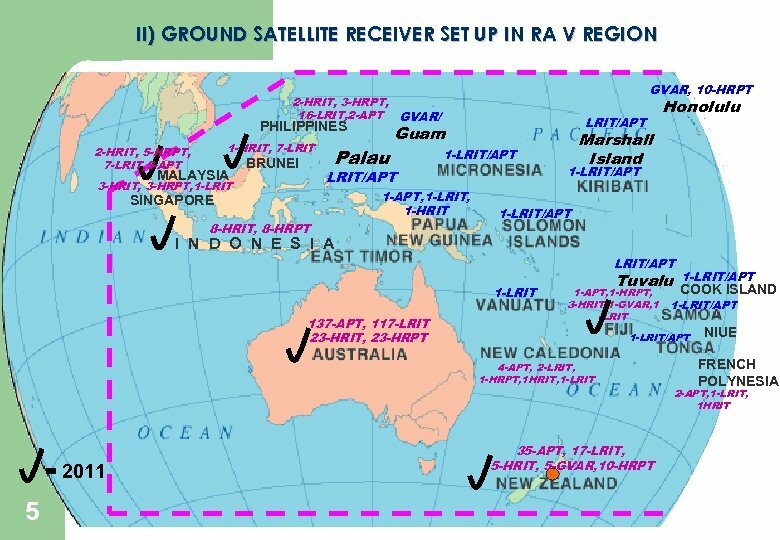 Ground Satellite receivers operated by RA-V member countries 3. 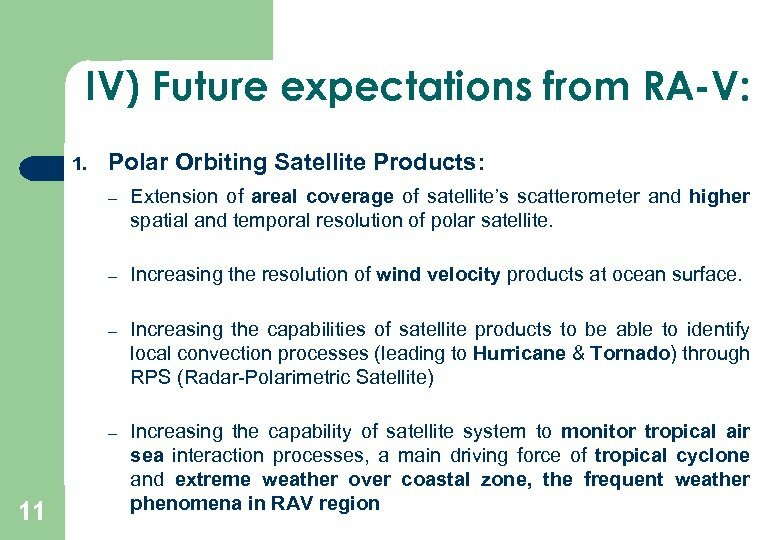 Common Major applications of satellite data in RA-V 4. 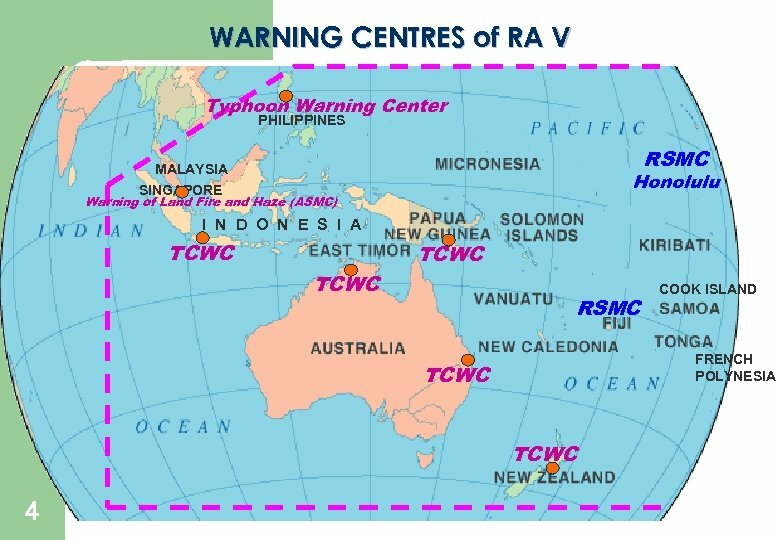 1 Introduction Important point and Future expectations of RA-V. 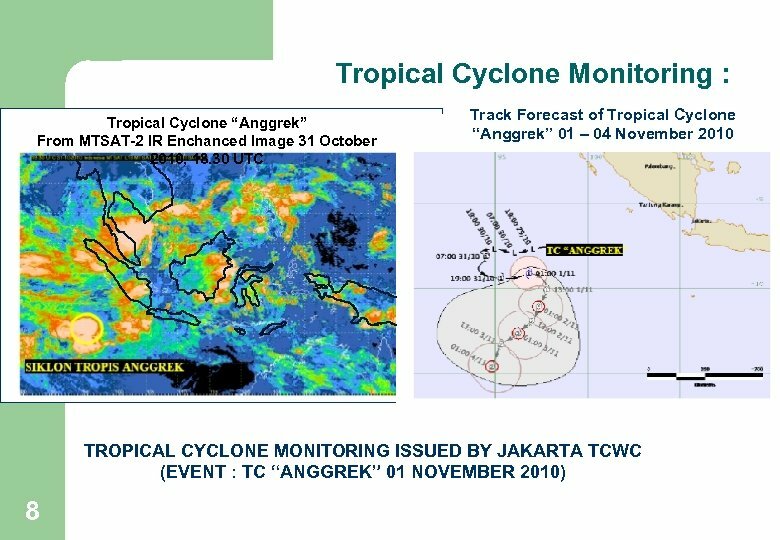 I) Introduction l l Indispensable need: Warning Center to anticipate the various significant weather and climate variability event. 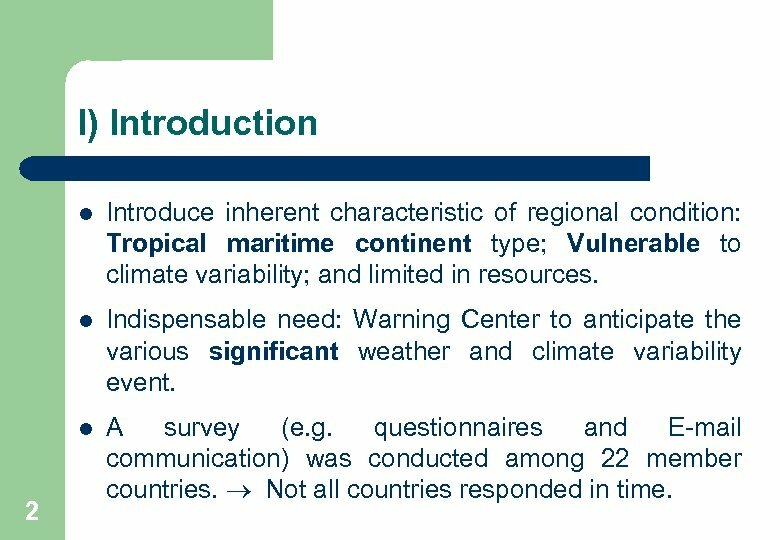 l 2 Introduce inherent characteristic of regional condition: Tropical maritime continent type; Vulnerable to climate variability; and limited in resources. 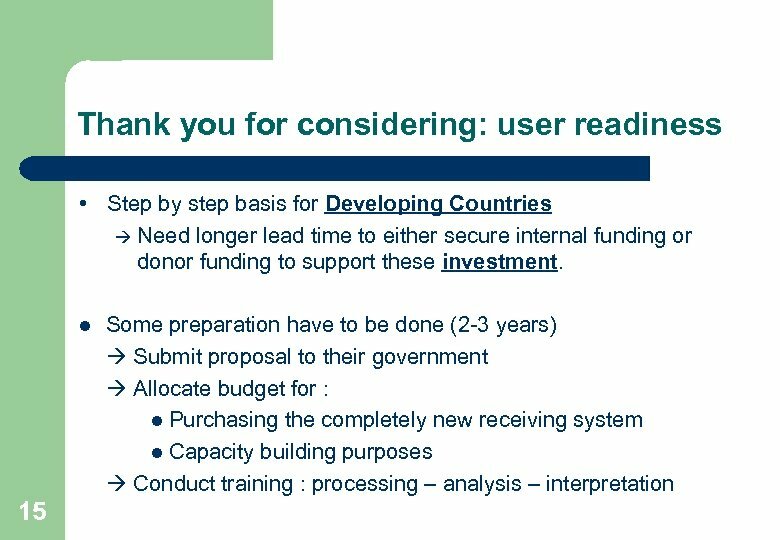 A survey (e. g. questionnaires and E-mail communication) was conducted among 22 member countries. Not all countries responded in time. 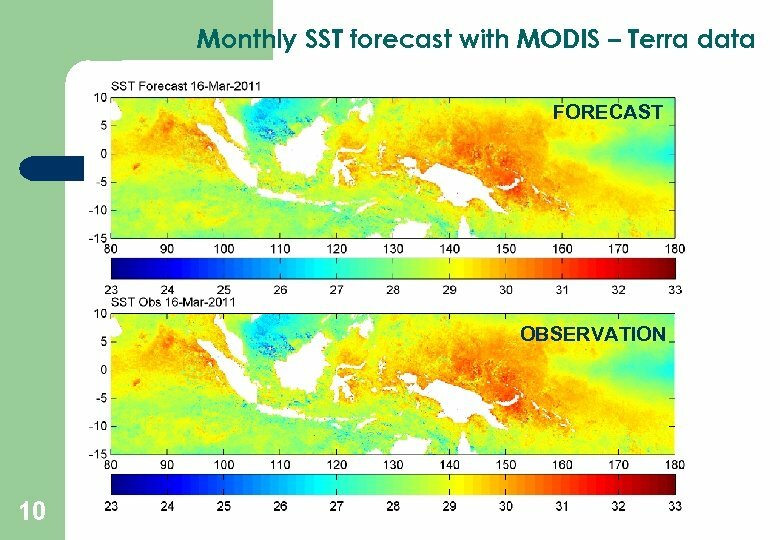 Future expectations (continued. . . ) 2. 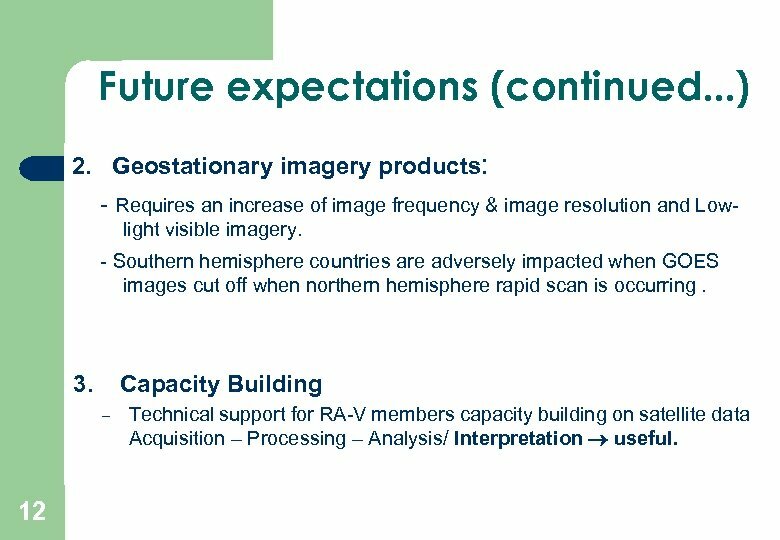 Geostationary imagery products: - Requires an increase of image frequency & image resolution and Lowlight visible imagery. 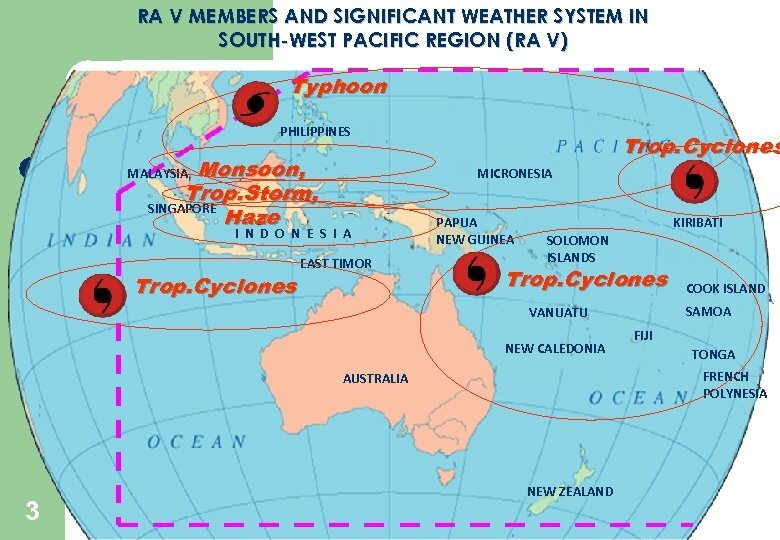 - Southern hemisphere countries are adversely impacted when GOES images cut off when northern hemisphere rapid scan is occurring. 3. 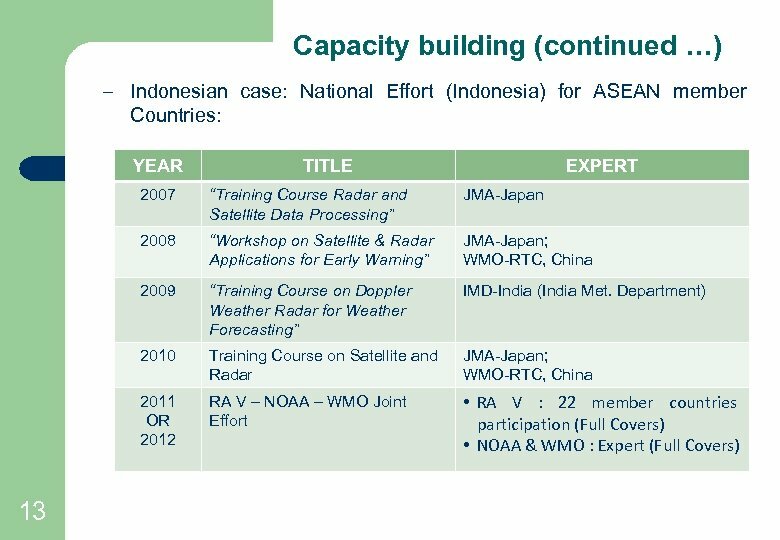 Capacity Building – 12 Technical support for RA-V members capacity building on satellite data Acquisition – Processing – Analysis/ Interpretation useful. 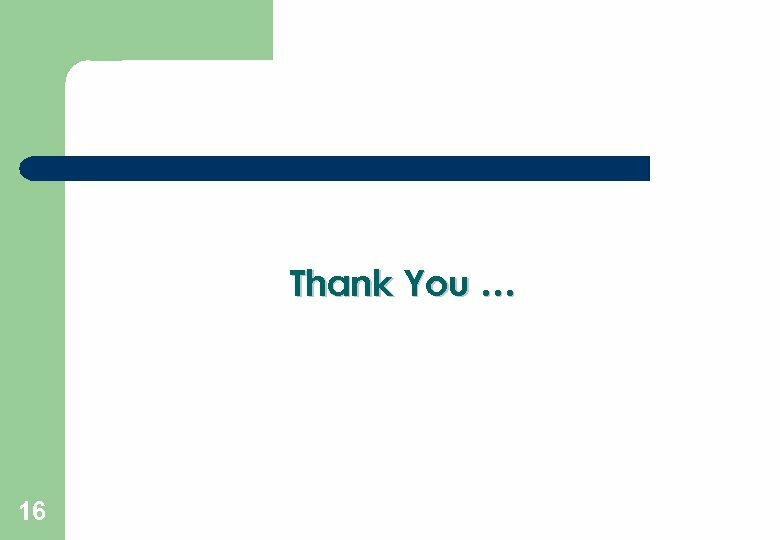 Cont… 4. 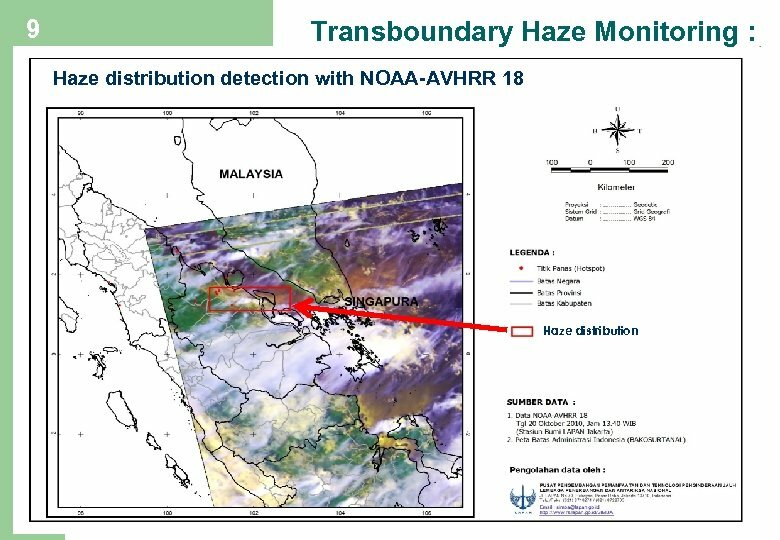 We hope to have a continuation of: – – 14 Direct broadcast of Hi-Res satellite data with current / minor upgrade of existing receiving systems when possible. – 5. 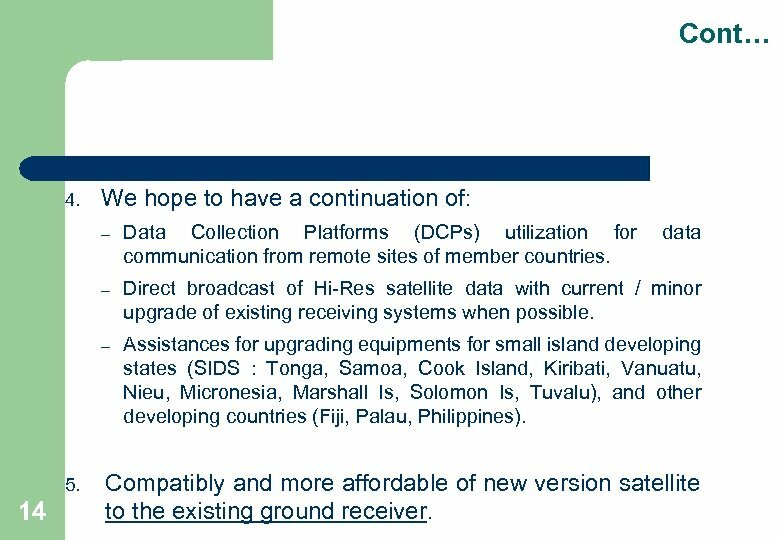 Data Collection Platforms (DCPs) utilization for communication from remote sites of member countries. 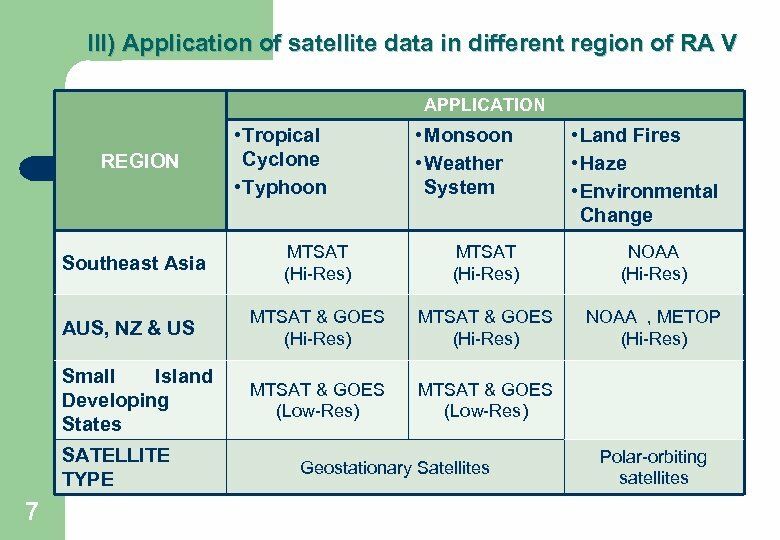 data Assistances for upgrading equipments for small island developing states (SIDS : Tonga, Samoa, Cook Island, Kiribati, Vanuatu, Nieu, Micronesia, Marshall Is, Solomon Is, Tuvalu), and other developing countries (Fiji, Palau, Philippines). 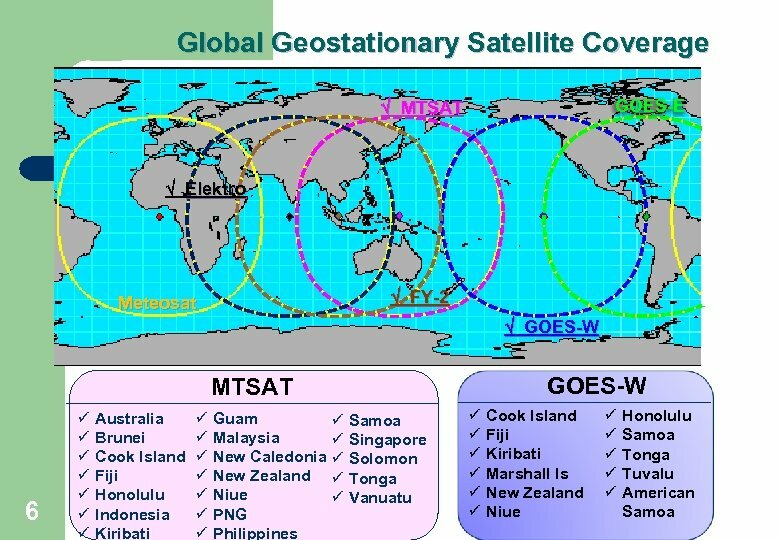 Compatibly and more affordable of new version satellite to the existing ground receiver.